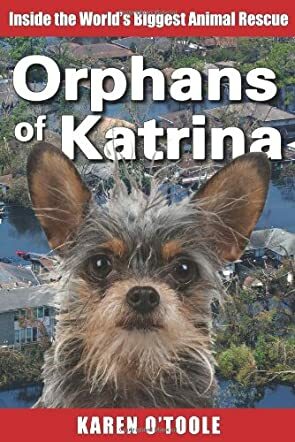 This book was about the authors time spent rescuing pets in the New Orleans area after Hurricane Katrina left the area devastated and many owners were unable to return to their pets. O'Toole, along with other animal rescuers, travels about the area, breaking into homes and saving animals from death. She chronicles her trials and tribulations, the sadness, heartbreak, and destruction she witnesses. Telling photos are also used to help explain what was seen. A deep understanding is shared by the author, as well as a willingness to learn from mistakes and prior judgments. I thought this book was well written, clear, and descriptive, without making me want to put the book down because it is so heartbreakingly sad. She keeps this in check nicely, by using facts and telling her story in a matter-of-fact way. It is still sad and devastating, but the author clearly made an effort to convey the story and identify the problems that were had in the Gulf so that they will not be mistakes made again in the future. I think many people will be interested in reading this book. In fact, 3 people who saw me reading it asked to borrow it. Many people are curious about the Hurricane Katrina tragedy, and this is an all-too untold side of the story, and a chilling account. Animal lovers will also be interested and will enjoy the read.